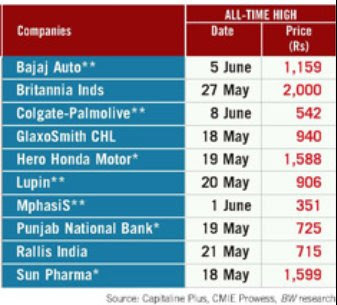 Some of the stocks are trading at their all-time high price to earning ratio. Rise in stock price in a declining market normally passes off as a sign of healthy fundamentals. But when the Indian and global markets were into a free fall last year, there was almost no stock in the domestic market that bucked the trend on the basis of business performance. Should you buy stocks at very high P/E ratio? Let's try finding it out. Even though NIfty at 4400 levels is still 50-60 per cent short of its all-time high of 6287 on 8 January 2008, market exuberance has led to many companies’ share prices raising their price to earnings (P/E) ratios — number of times the market price is more than the ‘earnings per share’ — to extremely high levels. 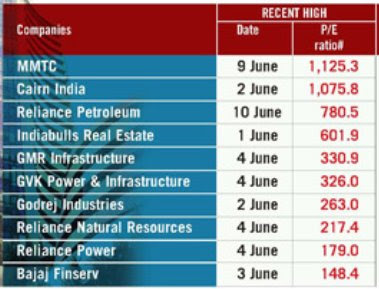 While in the western markets, P/Es don’t go above 100 even at the peak of a bull run, in India P/Es are already going past the 100 mark even though the market is nowhere near its peak. Between 1 May and 10 June, the rampage in the market has caused at least 10 P/Es to go past 100 (see ‘Significant Numbers’), the reigning leader being MMTC. Another 11 stocks had P/Es between 50 and 100, including Aditya Birla Nuvo, Kotak Mahindra Bank, IRB Infrastructure Developers, Jai Corp., Adani Enterprises and Television Eighteen India. P/Es aside, the traded prices of five Sensex or Nifty stocks and 10 BSE-200 index stocks have crossed their earlier all-time highs during this period. “Five index stocks out of 50 total index stocks is a decent number to warrant notice,” says Anand Tandon, head of equities at Brics Securities. Fundamentals can only partly explain the euphoric sentiments. “It may be due to performance over expectations by the market from these companies in the next two years,” says Nandan Chakraborty, vice president-research at Enam Securities. The stocks reaching their all-time P/E or traded peaks are not from two or three sectors alone. They are spread out across five or six sectors. But sectors such as consumer goods and pharmaceuticals, which were not exactly the darlings of the stockmarket in the bull rally of 2006-07, are standing out in the ongoing current rally much more than others. So, should investors buy stocks at P/Es of 50 and above? Is there any further momentum left in these stocks? Under the current circumstances, restraint may be better than adventurism to avoid the blood bath of the recent past. Nice article, keep it up good informative.